Yet if Tris wants to uncover the truth about her world, she must be stronger than ever...because more shocking choices and sacrifices lie ahead. Insurgent starts right where Divergent left off, and for the second time we're thrown straight into the socially divided city of Chicago as everyone turns to or against each other. The world is chaos, and there's no telling what will be around the next corner or on the next page. Dealing with an immense amount of guilt over the death of her parents and best friend Will, Tris is spiralling out of control. She is constantly putting her life on the line, and most of the time even Tobias can't do anything to stop her. Insurgent is about consequences, and how far you would go to save someone you love...or hate. Like Divergent, I found this to have a very slow start, but the ball was soon rolling and I flew through Insurgent. When I attended the Divergent movie premiere in London I had only read the first book in the trilogy, so I decided to start reading this. Admittedly I was reluctant because Divergent makes a good standalone and I was worried about Insurgent having read a few negative reviews, but I gave it a go and I'm glad I did! Now I'm crossing my fingers I get to go to the Insurgent premiere too because a) it was the best day of my life and b) I have become more than a little obsessed with the entire trilogy, film, soundtrack and cast. I need professional help. The thing I liked most about this book was that we got to see the other factions: what they were truly like, who was in them, how they worked and what place they played in society. Divergent had mainly been about setting the foundations, and it was nice to have a change of scenery. Another thing I'm loving about this trilogy is there is no love triangle. Sometimes they work but most of the time they really annoy me and most other readers, so it's great that one of the most hyped YA books is a book with no love triangle. It's just Tris and Tobias, and this was really refreshing to read. The ending was pure genius. It was a cliffhanger which was frustrating, although I had Allegiant already so it didn't leave me hanging for too long. However, the ending was something which no one could predict. There had been no clues about it, so it was great to be properly taken by surprise by a book for once! I always feel a bit strange reviewing massively-hyped books because it seems like most people have read them already, but if you haven't read the Divergent trilogy then I highly recommend you do. I understand the hype can put people off, but if you're in need of a believable, exciting, unpredictable book then I'm sure you would enjoy this. 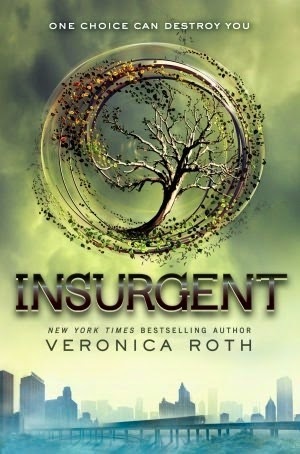 I did not enjoy Insurgent as much as I enjoyed Divergent, but I still liked it and so it's receiving 4.5/5 from me! Now I'm halfway through Allegiant and it's looking good so far, so my review of that should be up soon enough. I totally agree that Divergent could have been a stand-alone, but I did love all the other books. Great review and glad you liked it, can't wait for your book #3 review. Glad you are enjoying the series, it's my new fav - looking forward to your review on Allegiant!